14 Snowflake patterns in a variety of sizes. From back cover, Beaded Lace Snowflakes Ornaments can decorate Christmas trees, windows and gift boxes. They can even be made into earrings, necklace drops and a focal for bracelets. This book has 14 beaded snowflake patterns with full color detailed diagrams and instructions. Stitch them in sparkling, snowy white, or let them twinkle in a holiday rainbow of colors. I have also included a lot of pictures to show that the snowflakes can be made in different colors. 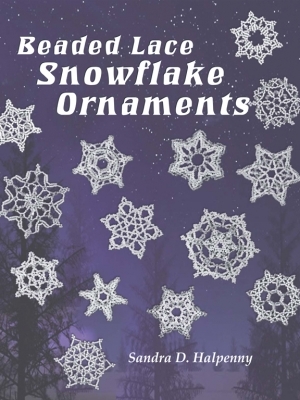 Also available: Beaded Lace Snowflake Ornaments PRINTED BOOK! Also available: Beaded Lace Snowflake Ornaments PDF Download!